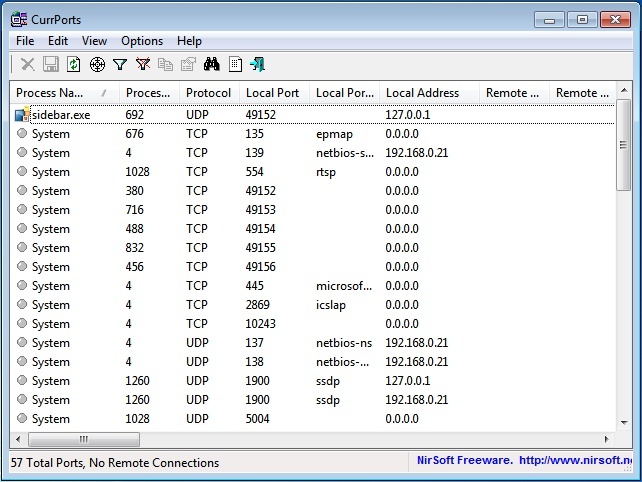 There is a small freeware Utility called CurrPorts from Nirsoft that displays all open ports on windows. Unpack the .zip file and double click on the file cports.exe to start CurrPorts. The application will show you a list of all open ports and offers the ability to apply filters on the list. Thia little program is great it leaves no footprint when in use and is very handy at finding leeching programs that have either attached themselves to other processes such as IE and for those that are just disguising themselves as knowen processes by using the same name. can i get any help! I have the same problem after I re-installed my OS (Windows 7). Before no problem.